The business Buildercost Systems was borne out of the need of our local building industry for a quick and accurate drafting and estimating service. At the time Buildercost Systems became a registered business, our drafting and estimating service had been operational for approximately two years. The sheer volume of work in the form or quantity takeoff and estimating we were engaged to undertake became impossible to manage using a manual system. Even though the amount of drafting had decreased (by choice) the estimating side of our business had increased tenfold. It was clearly evident that radical changes were required. It was early 1982 when affordable personal computers became broadly available in the form of System 80s and Tandy TRS80s. I remember clearly my feelings of awe when I first witnessed the seemingly unlimited power of the TRS80 running Visicalc. Visicalc was the forerunner of programs such as Lotus 123, Quattro Pro and Excel, all of which are electronic spreadsheet programs. Nothing on earth, it seemed, could calculate, add and total like Visicalc. It took me approximately five seconds to decide that a computer would be my salvation and departed the demo the proud owner of a new computer and printer. I remember the feelings I experienced and my thought that my problems would soon be over. Wrong! My problems had just begun. What followed was months of gnashing of teeth and tearing of hair. To cut a long story short, approximately seven years passed before it became clear to me that there was a greater demand for my software than my estimating service. Out of this new need, our first commercial software was developed and sold. It was now early 1989. 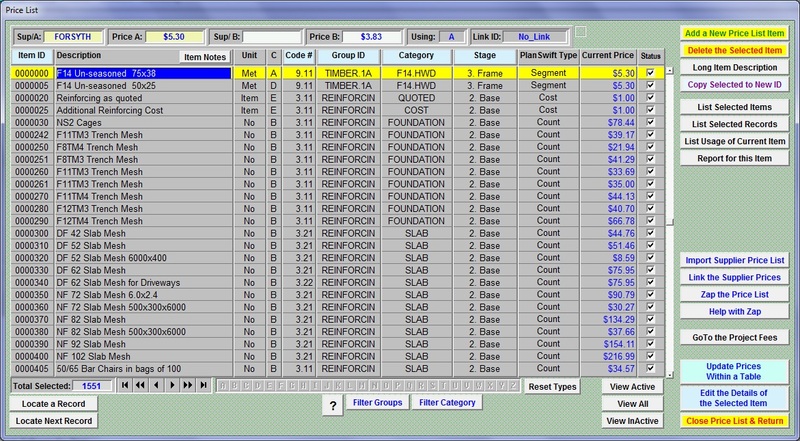 From our original spreadsheet templates the program had evolved into a relational database package. The first release of the software was based on a DOS database program. Our latest Windows based software is also built on database software. Buildercost the software, now at Version 10.0, has been a very successful package. We consider it to be very user friendly and comprehensive and the feedback from our users backs up this claim. Several hundred packages have been sold since its humble beginning. We at Buildercost Systems are proud of our achievements with the development of this software and firmly believe it to be exceptional value for money.